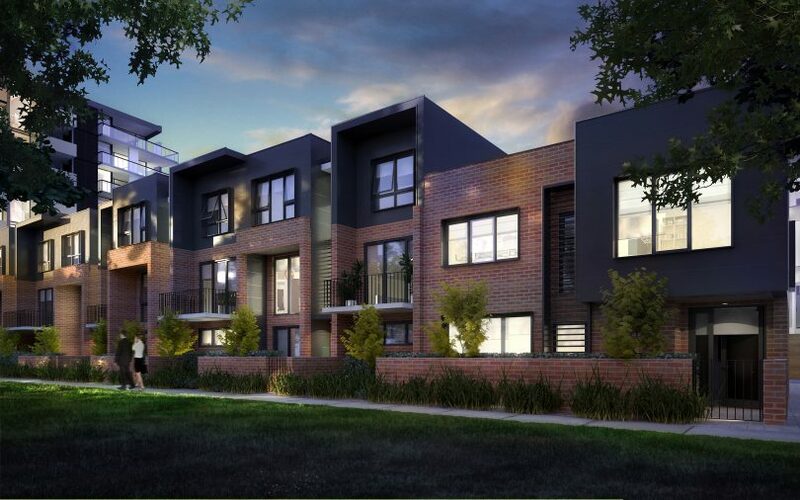 A new inner city apartment and terrace house development that embraces the heritage of Braddon and the spiritual home of sport in Canberra, Northbourne Oval, will be released to the market on Saturday (11 August). 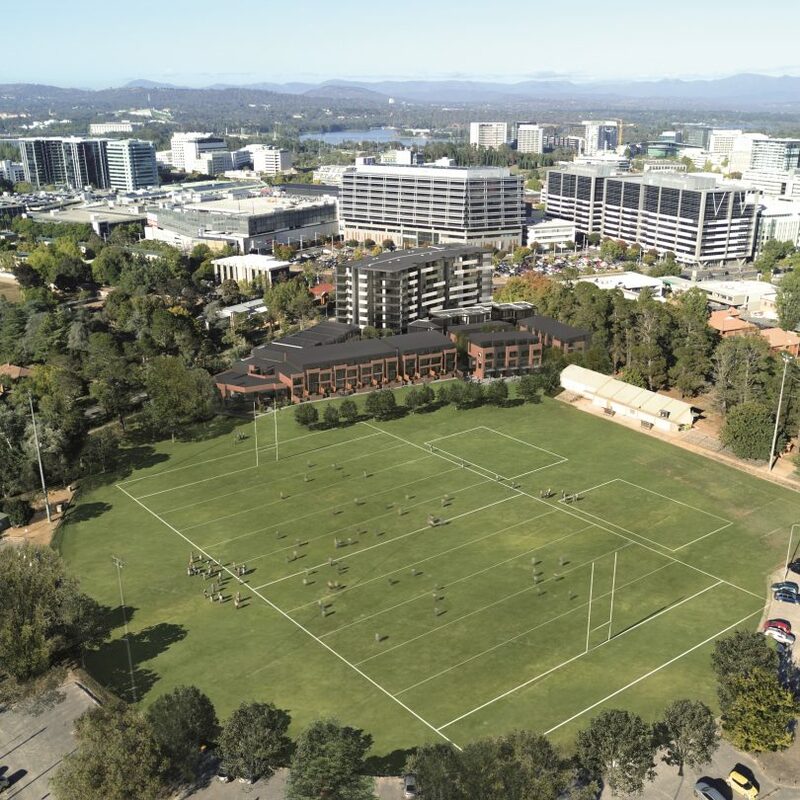 The Grounds – offering 92 one, two and three-bedroom apartments over nine levels, and 48 two, three and four-bedroom, two to four-storey terrace homes – is being developed by Lockbridge for the Canberra District Rugby League on its site bounded by Torrens, Donaldson and Cooyong Streets and overlooking the heritage-listed Northbourne Oval. Apartments start from $355,000 for one bedroom, two bedrooms from $505,000, and three bedrooms from $1,260,000, and include a range of car parking configurations. Two bedroom terraces can be had from $720,000, with three bedrooms selling from $1,095,000 and four bedrooms from $1,350,000. They include single and double garages with internal access, with select terraces fronting the oval. The Grounds will maximise the northerly aspect and have a minimum EER of 5, with double-glazed windows throughout to soften the sounds of the city and enhance climate comfort, and the terraces and three-bedroom apartments having ducted heating and cooling, as well as engineered timber flooring. All apartments and terraces will include induction cooking and wall ovens, and be NBN ready for internet access. The Terraces are generous and flexible. 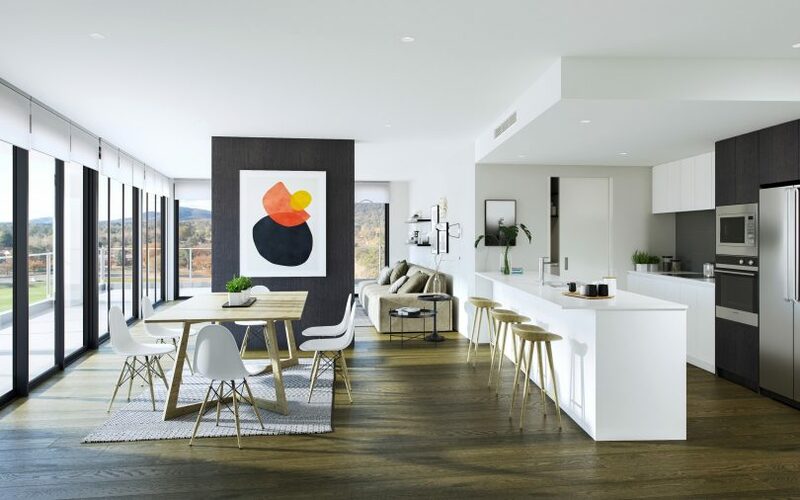 Executive Director of Independent Project Marketing, Wayne Harriden, said the development was a milestone for Braddon, offering a blend of Canberra’s history with the convenience of modern city living. “Opportunities like this are few and far between. Where else in Canberra do you have the chance to buy a terrace home across from the city centre and fronting heritage protected land? The convenience and lifestyle of city living, the culture of Lonsdale Street and the greenery of the surrounding areas – The Grounds gives you the best of everything,” he said. Granted heritage status in September 2000, Northbourne Oval will forever remain associated with the history of cricket, rugby league and Australian football in the ACT. This significance has been incorporated into The Grounds, from the development’s name and branding to each floor plan named after members of the Northbourne Cricket Club, whose connection to the oval dates to as early as 1925. Award-winning architects Judd Studio designed the apartment building on the southern tip of the site and eight three to four-bedroom terrace homes, with the remaining terraces by Marchese Partners. Interiors are by the Dept. of Design and grounds by landscape architects SpaceLab. “The Grounds design is sympathetic to the heritage of the site. The developer has worked closely with the architects to complement the surrounds and accentuate the character and soul of the area,” Mr Harriden said. What to expect in an apartment living room. Director of Judd Studio, Nathan Judd said the apartment building nestled into the southern corner of the site and acted as a high-quality marker building. “The building is unusual in that most of the apartments are much larger than normal, and would suit downsizers and others seeking a house-sized apartment close to the city,” he said. 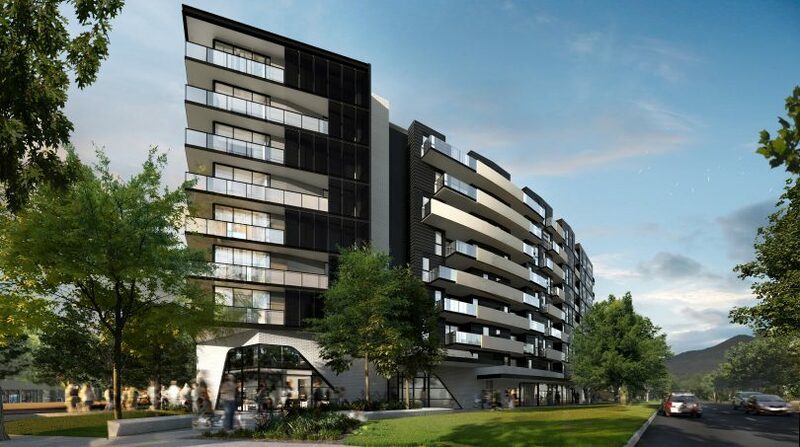 Mr Judd said the precinct would enliven the city end of the site, which is currently a gravel car park, and the terraces would meet a lack of this type of housing in inner Canberra, with Northbourne Oval as a beautiful backdrop to the project maintaining its primacy. “The townhouses are generous and flexible, some with living areas lifted above street level, leaving open the possibility of ground floor, low-scale commercial uses such as home offices and start-up businesses,” he said. He said the design was classic and contemporary, with a mix of materials and building forms that complemented and were sympathetic to the inner urban context. “The new precinct does an excellent job at mediating between the high-density city context and adjacent redevelopment and reasserts a two-storey suburban character as you progress up Torrens and Donaldson Streets,” he said. Mr Judd said the development utilised a range of high-quality metal façade and feature steelwork, large glazed windows and feature brickwork made of durable low-maintenance materials that would ensure the development looked as good on day one as it did in 20 years’ time. “People can expect a compact and distinct precinct that offers a sense of identity and community. It will be a very unique place to live,” he said. An aerial view showing an artist’s impression of The Grounds and Northbourne Oval. Mr Harriden said there had been strong interest from a range of buyer types, due to the varying product offerings, location and price options. “The Grounds has a very diverse product mix, designed to attract a large segment of the Canberra market. From first home buyers to families who value an inner-city lifestyle, there are floor plans and product types to suit every buyer,” he said. The development will also include ground-level commercial space suitable for offices, restaurants or cafes. The CDRL scaled back its plans for the site last year when it scrapped a controversial $80 million proposal for 156 apartments, saying it was uneconomical. On the western side of The Grounds, the Canberra Raiders is planning its $19 million Centre of Excellence, which will include indoor training facilities, conference rooms and see the oval being used for training and community events. Construction of The Grounds is scheduled to commence late in 2018, and estimated to be completed in late 2020.